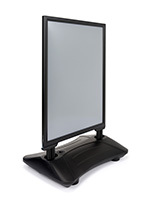 Pavement signs draw traffic into a business! 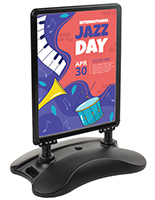 These sidewalk displays, pavement signs are perfect for positioning outside of a restaurant, retail store or salon to promote upcoming sales or events. 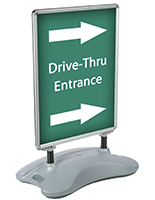 The pavement signs, also known as sidewalk signage holders, feature (2) 22"w x 28"h aluminum snap-open frames for displaying graphics securely. 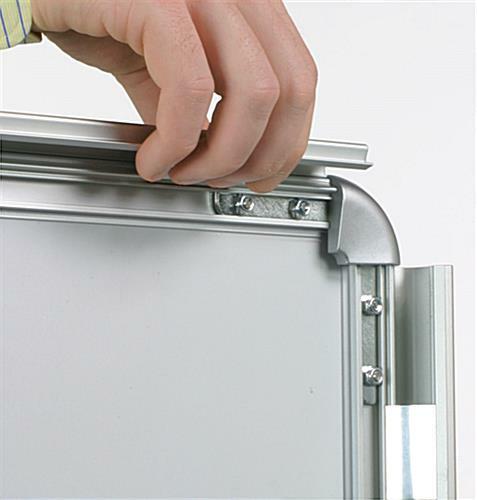 To set up, simply slide your posters underneath the non-glare lenses and snap the molding shut. 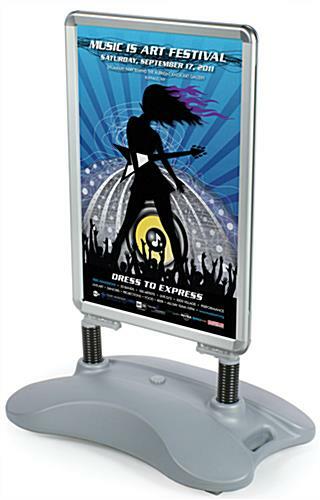 These pavement signs, with their double-sided design, help by positioning posters in a more prominent location outside of a business. 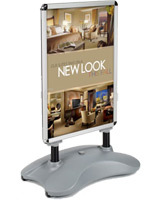 These pavement signs are constructed for durability and longevity, yet are affordably priced to fit any budget. 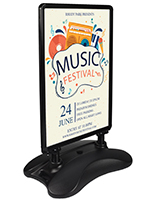 Pavement signs, such as sandwich boards or sidewalk displays, feature a water-fill base, ensuring they do not topple in bad weather. The sidewalk displays, pavement signs also have spring shocks located on the bottom each frame. 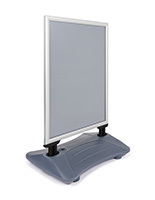 Shocks allow the pavement signs to sway with heavy winds, while the water base keeps them in place. 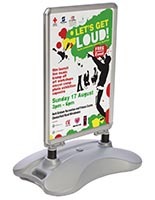 We also provide the pavement signs with built-in handles and wheels, to make repositioning your outdoor display even easier. 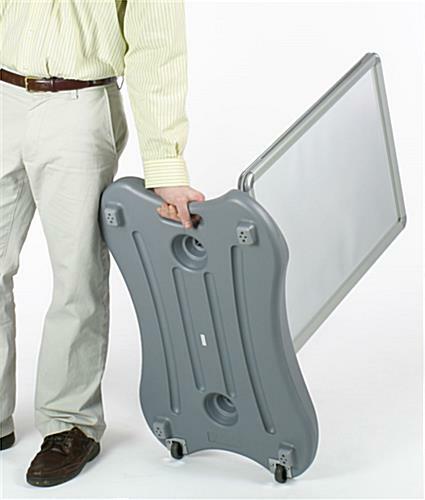 Shipped unassembled, these pavement signs are put together effortlessly, only requiring your own 22"w x 28"h posters. Please Note: While these pavement signs are designed primarily for outdoor display, they are not intended for use during inclement weather, including heavy rain, snow and high wind conditions. 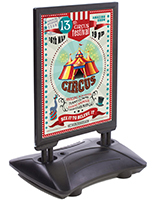 They are not "seal-tight" displays, meaning water can seep in under the lenses and could potentially affect posters. We always recommend bringing these pavement signs inside during such conditions, as well as overnight. 25.3" x 41.5" x 19.5"
32.0" x 6.3" x 19.5"
I run the marketing dept for internal college organizations at a state-funded institution. Dollars are tight, and since we're on a hill, wind is strong! I had to find a solution for sidewalk signs that wouldn't be forever falling over. So far, so good with this design. Far more sturdy than traditional sandwich/folding signs, these guys sit up, look sharp, and have the plastic lens to cover the poster. The snap in frame is AWESOME, and these signs make my customers look good! Talk about outdoor advertising! This looks great, Holly! We're so glad to hear these signs have held up nicely against the wind. We hope you'll shop with us again soon!